The Ebury closed on 5th November 2012. When The Ebury first opened up in what was a neglected corner of Pimlico, replacing a grungy old man boozer, the only surprise was that there wasn't anything like it in what should have been a well-to-do neighbourhood. 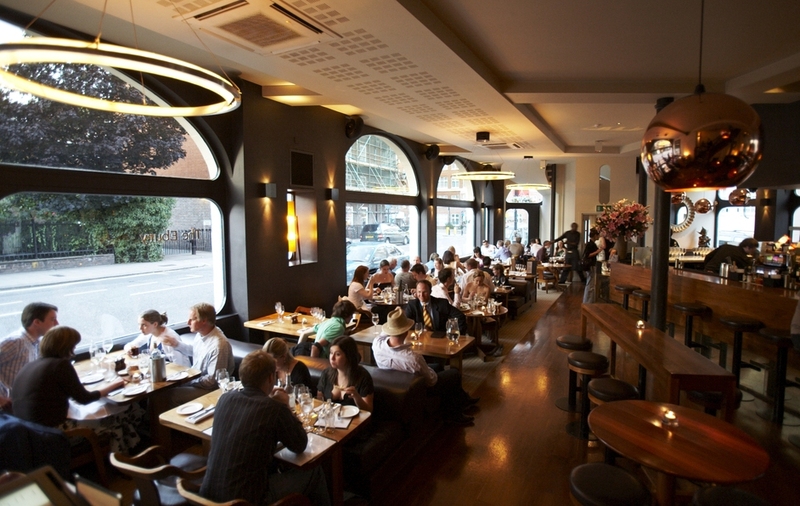 Despite increased competition since then, The Ebury still stands out as a very classy brasserie. What appeals is the gleaming wooden bar, low level chandelier lighting and fabulous cocktails served by smiling staff in the wonderfully expansive, high ceilinged bar. That's not all. You can happily sink into comfortable low leather seats at tables lining the street-side window and enjoy a classic British menu. Or ascend the sweeping staircase to the first rate first floor dining room where regular Jazz Supper evenings are held. Enjoy a menu that includes Duchy of Cornwall rock oysters, terrine of foie gras and roast cod with mash, followed by lavender pannacotta with passion fruit sorbet, all the while listening to live jazz. The same outfit run The Running Horse near Bond Street and The Waterway, Warwick Avenue. Each comes with a certain sophistication that ensures a cool, crowd of young 20 to 30-somethings keep coming back. The Ebury gyms, sporting activities, health & beauty and fitness. The best pubs near London The Ebury. The Ebury clubs, bars, cabaret nights, casinos and interesting nightlife. Where to have your meeting, conference, exhibition, private dining or training course near The Ebury. From cheap budget accommodation to luxury 5 star suites see our special offers for The Ebury hotels, including Sloane Square Hotel London from 86% off.